MAEKAN | Stories for the Curious. The Sharing Platter explores how the world’s peoples, despite vast geographical and cultural distance, ended up creating or adopting some very similar foods that fill the stomach and warm the heart. This series is both a feast for the eyes and food for thought as we look to plump up and re-shape our perspectives on food and culture. Ah, the humble dumpling. It’s a dish so comforting and simple that it developed in a wide variety of cuisines. Food historian Alan Davidson wrote, “a dumpling is a food with few, indeed no, social pretensions” and he would be right. Versions of the dumpling are found all four corners of the earth and have sustained cultures through tough times to become part of national food histories. While we might strongly associate dumplings today almost exclusively with the filled variety, it’s important to remember that the dumpling’s simplest form is just a lump of dough that’s easily formed and often cooked in batches by a family or community in some kind of large vessel whether that be filled with water, soup, oil or the rest of the meal such as a stew. Under this definition alone, we get to see a huge variety of shapes and form factors that are all affectionately referred to as “dumplings” in their respective cuisines. Our first group of dumplings are the most basic in the sense that they are unfilled and appear as delightful balls of starch as massive as an apple or as tiny and uncountable as if they were grains of rice or individual noodles. Our first entry, Banku, is on the apple-size end of the spectrum. A Ghanaian staple, Banku is made from a mixture of fermented corn and cassava and cooked in hot water. Like kenkey and zsemlegombóc on this list, it’s is a dumpling that’s used to pair with another dish, much like we might do with rice or potatoes. In Banku’s case, it’s often served with soup, stew or a pepper sauce with fish. This American comfort food is mainly associated with Southern cooking, though it’s also eaten in the Midwest. It is rumored to have originated in the South or French Canada during the Great Depression as a means to stretch chicken during hard times. Yet, recipes for chicken and dumplings appeared many decades before the stock market crash. The “dumpling” is really more of American biscuit dough, boiled in chicken broth and served with boiled chicken, often with vegetables and herbs. To this day, we’re still racking our brains wondering if the empanada is a dumpling. But in the process, we stumbled upon the unquestionably quintessential “unfilled” dumpling, the chochoyote. While Mexican food is popular all over the world, few seem to know about the chochoyote outside of the country. They are masa (corn dough or flour) dumplings with a unique shape—a little ball of dough with an indentation in the middle, giving it a mini bowl shape. The dough is made from lard and masa—the same maize flour used to make tortillas and tamales. Sometimes add-ins like herbs, garlic, or cheese are added to the mixture. Chochoyotes are boiled in broth and used to make all sorts of Mexican comfort dishes like mole and soups. In some recipes, they are stuffed with cheese or other ingredients. A skewered Japanese sweet made from rice flour rolled into a ball served with various seasonings ranging from red bean paste to sesame to a sweet soy sauce glaze (this last one is called mitarashi dango and you’ll find these all over the place including your favorite Japanese convenience store). Great with green tea. Gnocchi is one of the first items on our menu that generates discussion or all-out debate on whether or not it’s pasta or dumpling. You’ll certainly find gnocchi in the pasta section of a menu at many Italian restaurants in North America, but the fact they can be prepared with ingredients other than pasta’s traditional unleavened dough and the fact they are lumps of chewy dough alone make a strong case for them being dumplings. For those who prefer a lighter option, gnudi are pillowy balls of ricotta and spinach. They’re named for the Tuscan word for the Italian nudi for ‘naked,’ since they’re essentially naked ravioli filling without the pasta. A favorite in Central and Eastern Europe, halušky can appear as noodles or dumplings and refer to the dumplings themselves or the complete dish. The dough is made with flour and/or potatoes with some regional variations mixing in dry curd or cottage cheese. A popular Slovak (hah-LOOSH-kee) dish called bryndzové halušky uses soft sheep cheese called bryndza and tops it with bacon and chives, while one Polish (hah-WOOSS-kee) variety has them sautéed with onion, cabbage and butter. This Czech bread dumpling is true to its name in both how it’s made and how it looks. Making use of stale bread cubes, eggs, flour and salt, the combined dough is rolled into a familiar loaf shape, boiled and sliced like bread. The resulting flat dumplings retain the porous texture of their original ingredients, making them perfect for soaking up gravy or the jus from the roast goose it was served with. Kenkey or kormi is a staple in regions of West Africa—Ghana, eastern Côte d’Ivoire, Togo, and western Benin in particular. It made its way to Caribbean countries like Guyana, Jamaica, and Trinidad with its own local names for the dish. Kenkey is similar to a sourdough dumpling and is traditionally made from fermented ground corn and steamed in banana leaves, corn husks, or foil. It is served with sauce and protein, depending on the region. Carribean versions of the dish may also contain plantain, green banana, sweet potato, or cassava. Knödel or Klöße (Klösse) both refer to boiled dumpling in German, and in this case, specifically the savory ones. Using mashed potatoes that are mixed with herbs and spices such as parsley or nutmeg, the starch is rolled into balls or lumps and steamed to create kartoffelknödel or potato dumplings. Like halušky, the German equivalent would be spätzle (“shpetzla”). Spätzle is a diminutive of “sparrow”—which they looked like before the use of mechanical devices such as a strainer to press the dough through. 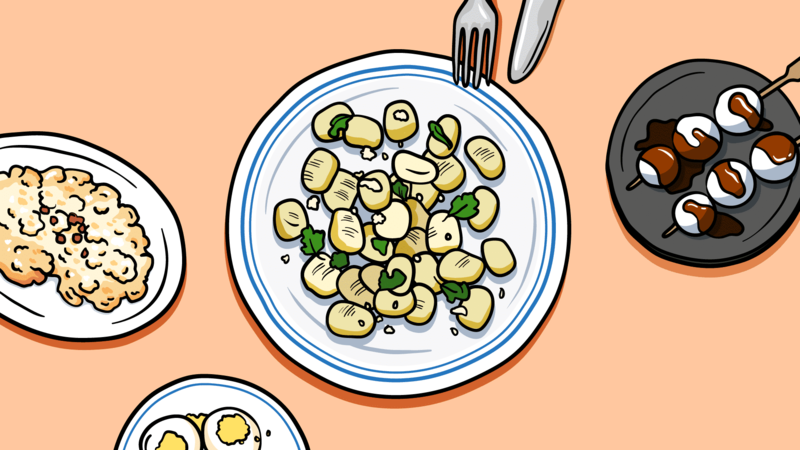 Knöpfle (“k’nupfla”), which means “small buttons,” is the small lump form of spätzle closer to gnocchi. Spätzle is eaten in Germany, Austria, Switzerland, and Hungary, as well as German-speaking regions in France and Italy. Spätzle dough is typically made from eggs, flour, and salt. It is used in several dishes such as Käsespätzle (spätzle mixed with grated cheese and fried onion) and Gaisburger Marsch(beef stew). Dessert versions of spätzle are also enjoyed in southern Germany. Matzah balls (also spelled matzo balls) are from Ashkenazi Jewish cuisine. Matzah is an unleaved flatbread. This flatbread is ground to make matzah meal, which is then combined with eggs, water, and oil or schmaltz (chicken fat) to make matzah balls. These dumplings or typically served as Matzah ball soup with chicken broth. It’s both a dish traditionally served during Passover, but also an everyday comfort food on Jewish deli menus. 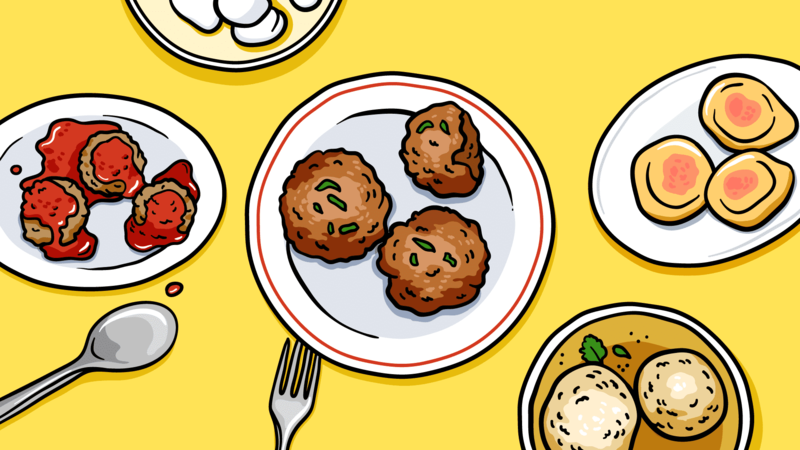 According to author and chef Joan Nathan—who specializes in Jewish cuisine—matzah balls used to be called knödel, which is a boiled dumpling popular in Central and Eastern Europe. The matzah ball was considered a knödel made from matzah meal. In the 1930s, U.S. Manischewitz company started packaging the product, calling them “Alsatian feathery balls. Nathan says it was likely American comedians that used the term “matzah balls”, thus popularizing the name. This Chilean home cooking favorite might make us think it’s starting to wade into noodle or pasta territory with its flattened form, but its preparation makes it very much a dumpling. Pantrucas are made from a simple dough of flour, oil and water before being cut or hand torn into irregular shapes. These are then often cooked in beef broth or verduras (vegetable) soup. Pronounced “sews-klekkies,” these stick-to-your-ribs South African dumplings are a heritage dessert made by scooping dough into boiling water, where the irregular lumps quickly fluff up (from the baking powder). These fill up their dishes as bumpy little mounds ready to be doused in a cinnamon flavored syrup or a custard sauce, a perfect comforting way to cap off a family dinner. Translated from Cantonese, Tong Bat Lat literally means “sugar-doesn’t-come off.” Similar to the dango, these solid glutinous rice dumplings have a chewy springy texture with most of their flavor coming from a topping. A traditional and still popular Hong Kong dessert, Tong Bat Lat are rolled in a mixture of crushed peanuts, sesame seeds and yellow sugar. Like houskový knedlík, this Hungarian bread dumpling is made with stale bread, but is scooped or rolled into a ball. Pronounced zsem-leh-gom-boats, with the ‘zs’ sound in usually, these dumplings make the perfect companion to other traditional favorites like goulash or chicken paprikash soup. Guija or gujiya is a deep-fried dumpling with a twisted edge. Made with semolina or all-purpose flour, it can be stuffed with sweetened khoa (dried or simmered milk solids), grated coconut, cardammom powder and dried fruits. Gujia is enjoyed in India, Bangladesh, and Nepal, especially during the Holi festival. The Cantonese har gow (har like “hah!” and gow rhymes with cow) is along with siu mai below, the most recognizable of the dim sum dumplings. There are many dim sum favorites that have a slightly chewy see-through wrapper made with rice flour, but the har gow takes the award for the pinkest dumplings on this menu thanks to its translucent wrapper and pure shrimp filling. This Japanese dumpling’s name comes from the Chinese word jiaozi—a Chinese dumpling with meat or vegetable fillings. The jiaozi made its way to Japan after World War II when Japanese soldiers brought the recipe back from northeastern China. Like Chinese jiaozi, gyōza are prepared in a variety of ways. The most common style is pan-fried thin-skinned minced wrappers with pork, garlic, and vegetable fillings. Enjoy these with tare sauce seasoned with rice vinegar and chili oil. Mandu may not be the most internationally well-known aspect of Korean cuisine, but they are another important East Asian dumpling to know. There isn’t an agreed-upon origin story behind the Korean dumpling, but mandu are believed to have been brought to Korea by Yuan Mongolians in the 14th century or to have come to Korea from the Middle East via the Silk Road (see manti). Several regional variations exist, all with different preparation methods and fillings. For a spicy version of the dish, try kimchi-mandu. 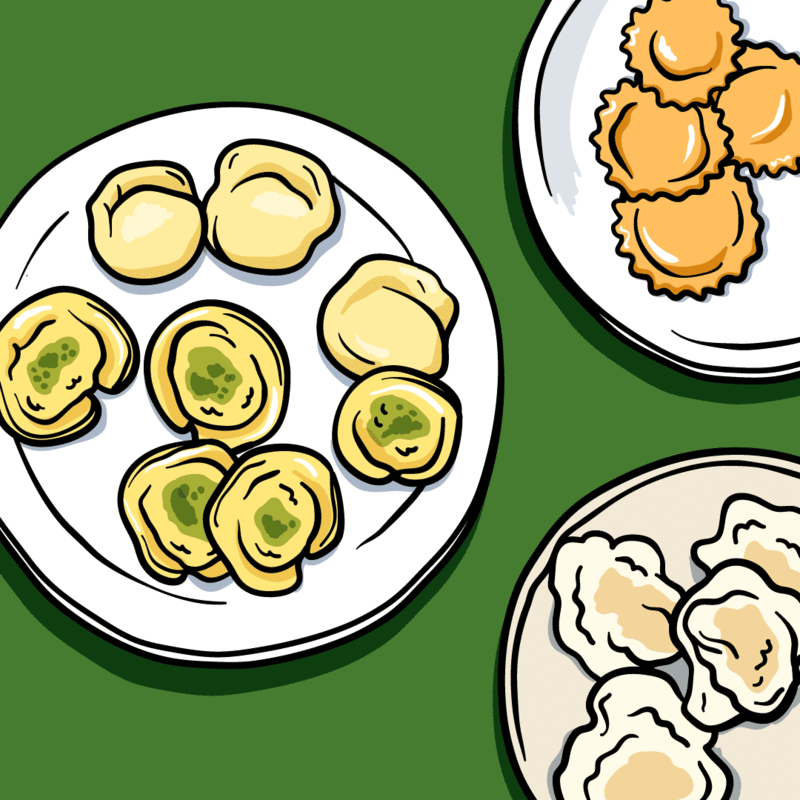 There are several legends about where the pelmeni is from. Some believe they came from China through Italy from Marco Polo’s expeditions. Others believe it was brought to Poland from Kiev. Another story says that it was created to feed the people during a famine caused by the Tatar invasion in 1241. But what we do know is that it’s a European comfort food that has also made its way to North America and has been popularized by Eastern European immigrants. These are stuffed with minced pork, lamb, beef or even venison, with the last one alluding to pelmeni’s popularity with hunters. Unlike its relatives the Ukranian varenyky and Polish pierogi, the fillings in pelmeni are usually raw, alluding to the traditional Siberian practice of treating the entire dumpling as a preserved food by carrying bags of them and freezing it outdoors in snow. Pierogi are a very popular Central and Eastern European dumplings. Typical fillings include fresh quark, potato, sauerkraut, and ground meat, though unlike the strictly savory pelmeni, sweet versions of the dumpling exist too. Savory pierogi is often served with melted butter, sour cream, or fried onion. The most common variation of Chinese dumpling are boiled dumplings or shuijiaozi (shway-jiao-dz), where shui means water and jiaozi means dumpling. Unlike a lot of Southern Chinese steamed dumplings, jiaozi are boiled and especially common further North. In some regions of China, they’re a staple food, where others eat rice or noodles. These can be filled with near countless combinations of ingredients. Many are pork based, but there beef, lamb and fish varieties and even a tomato and egg. Varenyky in areas with significant Ukrainian populations, where they might also be referred to as pyrohy such as with Canadian Ukrainian speakers. Common Ukraninian fillings include cottage cheese, potato, boiled beans, mushy peas, sauerkraut or fruit including blueberries. Ukrainian ancestors equated varenyky with a young moon since they have a similar shape and used the dumplings as part of pagan and sacrificial rituals. For example, cheese varenyky would be sacrificed nears water springs and years ago Ukrainian peasants also believed that varenyky helped bring a rich harvest, so they took homemade dumplings along to the fields. The Wor Tip (“wore-teep” said with a British accent) is the original “pot sticker” and translates accurately as such. Typically larger and longer than a jiaozi, the Cantonese wor tip retains its distinct half-moon shape throughout cooking and is almost always filled with minced pork and green onion. Whether it’s pan fried on one or both sides, the crispiness contrasts with its soft, juicy and potentially scalding filing. Traditionally eaten during the Mongolian New Year (but also throughout the year), buuz is a steamed dumpling filled with meat. These dumplings usually have a hearty filling of mutton or beef with onion, garlic and often seasonal herbs. Like many Asian dumplings, buuz has its origins in China. Much like the XLB, the more pouch-shaped Georgian Khinkali is a soup dumpling that is eaten by drinking the delicious broth on the inside on the first bite. Several varieties exist with modern ones using parsley and cilantro (also called coriander). In Muslim-majority areas the use of beef and lamb is more prevalent. Mushrooms, potatoes, or cheese may be used in place of meat. Found is many Turkic and Central Asian cuisines, manti is also popular throughout Russia and post-Soviet countries. Manti varies depending on the region, but these dumplings are boiled or steamed and typically contain a spiced mixture of lamb or ground beef, and are often served with garlic-yogurt sauce. While the name sounds similar to Chinese mantou, Korean mandu, and Japanese manjū, the origins of the Turkic dumpling are unknown. Appearing as a drop shape with a sharp peak, modak is a popular Indian sweet dumpling that’s fried or steamed. They’re typically made with freshly grated coconut and a South Asian cane sugar called jaggery, with a soft wrapping typically made from a combination of rice, maida or wheat flour and khoa. Because the sweet is a favorite of the elephant-headed Hindu deity of wisdom Ganesh, he’s also known as Modakpriya (“one who likes modak”). As such, modak is offered to him and served during Ganesh Chaturthi, the festival celebrating his birth. Likewise, a more pouch-shaped version of the dumpling called kangidan is served in Japan where Ganesha is known as Kangi-ten in some schools of Japanese Buddhism. Found in Tibet, Nepal, Bhutan, and parts of North India, momo is a South Asian take on the dumpling. It is believed to have come from Tibet, spreading to other parts of South Asia with the Tibetan diaspora where the filling of the dish was typically meat as vegetables were hard to access in Tibet. Vegetarian versions of the dish were created when it came to India, due to the large population of vegetarian Hindus. The dough is usually made from white flour and water, and the dumplings are usually served with hot sauce. Momo is typically a juicier dumpling, thanks to fatty meat or oil used in the filling. Siu mai in Cantonese (shaomai in Mandarin), is best known for being a staple in Cantonese dim sum and Hong Kong street food. The dim sum version of the dumpling is filled with pork, shrimp, Chinese black mushroom, scallions, and ginger. Instead of being wrapped up completely like many other forms of dumplings, the Cantonese siu mai has a thin outer wrapper that is typically yellow and worked up toward—but never covering—the top, with a dot of crab roe, carrot or even a quail egg on top. What many people may not know is that this dim sum favorite has its origins in Inner Mongolia. It was served in tea houses as a snack to be served with tea. 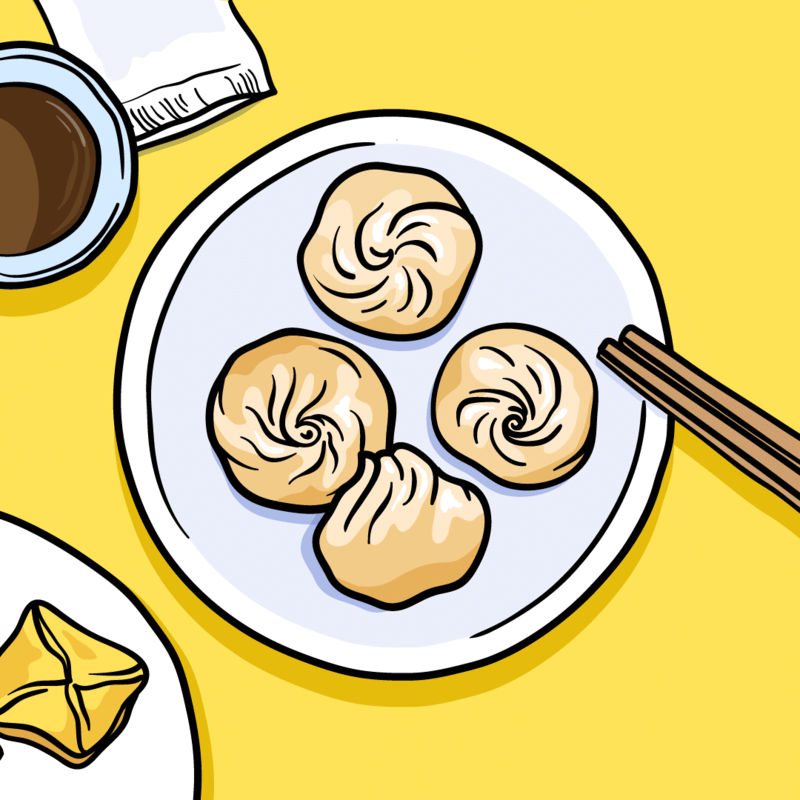 Many believe it was after merchants bringing the dish to Beijing and Tianjin that shaomai became widespread around China. 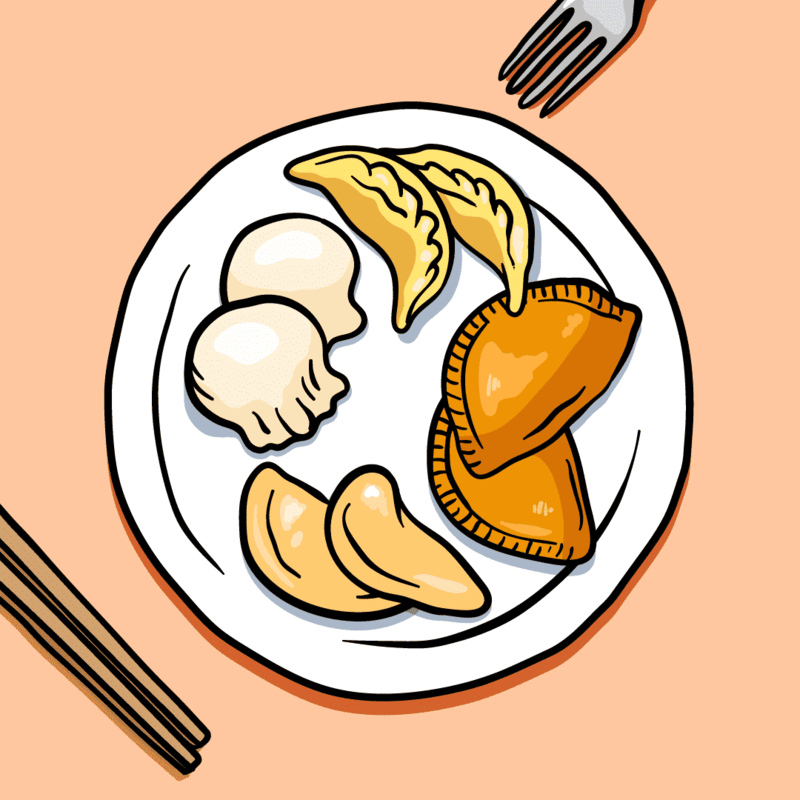 Different versions of the dumpling exist all over the country and has even been incorporated into Japanese, Indonesian, Philippine, and Vietnamese cuisine. The XLB is widely loved throughout China, Taiwan, and increasingly the west, thanks to the international popularity of Shanghainese cuisine. While the Chinese classify these as a “bun” or baozi, they are lovingly referred to as “soup dumplings” by English speakers. Steamed and served in a bamboo basket, xiaolongbao is traditionally filled with pork (or often pork with minced crab meat and roe) and hot soup. What’s the best way to eat a soup dumpling without burning your mouth or spraying hot soup everywhere? There are different methods, but using a spoon is a good start. Biting or nipping off some of the skin to let the contents cool is usually the next step. Don’t forget to dip your XLB in vinegar with ginger slivers. Like many dumplings in this category, this Afghan dumpling has a delicate wrapper where the two corners of a triangle are pinched together in front of the filling, giving the dumpling a tidy folded appearance like a pocket square or fancy napkin. These are filled with lamb and gandana, a regional variety of leek. If that wasn’t delicious enough, after a light boil, these are topped with a garlicky yogurt and a spiced paprika-coriander meat sauce. Ba Wan roughly translates into “meat circle” from the Taiwanese Hokkien, and the description is fairly accurate—at least before cooking. The wrapper is made of sweet potato starch, which when boiled, takes on a chewy consistency and a form that makes individual dumplings hard to tell apart and thus, have to be eaten in bites with utensils. Combined with a pork, bamboo shoot and shiitake mushroom filling and then served with a sweet and savory sauce, Ba Wan are as nourishing as they are filling, which is why they’re a beloved Taiwanese street food. A variation of Chinese American wontons, crab rangoon is an American guilty pleasure. Its usually served as an appetizer rather than a main. These dumplings are made with cream cheese, crab meat or imitation crab meat, and allium vegetables wrapped in wonton wrappers. They’re deep-fried and served with classic Chinese American condiments—soy sauce, duck sauce, plum sauce, sweet & sour sauce, or hot mustard. Another Central Asian and Middle-Eastern favorite is Joshpara, with local names in different regions. The Central Asian version of this dumpling is typically unleaved dough squares made of flour, eggs, water, and salt that are filled with ground meat. The type of meat varies, though pork is uncommon due to Islam. Other common joshpara ingredients include onions, and herbs. The dumplings are boiled in water or meat broth. The Middle Eastern version of the dish (shishbarak in Arabic) use wheat dough and are filled with ground beef and spices. The dumplings are cooked and then served in yogurt. Ravioli needs no introduction. While it’s thought of as a pasta dish, the ravioli is very much a dumpling in its construction as well. The dish has been mentioned in writings as early as the 14th Century and is now a well-loved comfort food all around the world (+1 if you ever ate Chef Boyardee as a kid). The dumpling is typically made with two thin squares of pasta dough. The Romans enjoy their ravioli stuffed with ricotta cheese, spinach, nutmeg, and black pepper, though regional versions differ. They are usually served in broth or with a pasta sauce. Whether the shape is square or circular and with or without a jagged edge, ravioli has the honor of being the most recognizable filled pasta and probably the most symmetrical. Much like its cousin ravioli, tortellini—and its larger sibling tortelloni—are simultaneously claimed as pasta and dumplings because of their filled form factor. Alternatively known as ombelico (“belly button”), the navel shape of tortellini puts it in line with the above mentioned strikingly similar shapes. Fillings can very widely to include cheese and vegetables, mushrooms or meat. Wontons are found across several regional cuisines in China and are recognizable by their loose flowing wrappers surrounding a ball of filling. 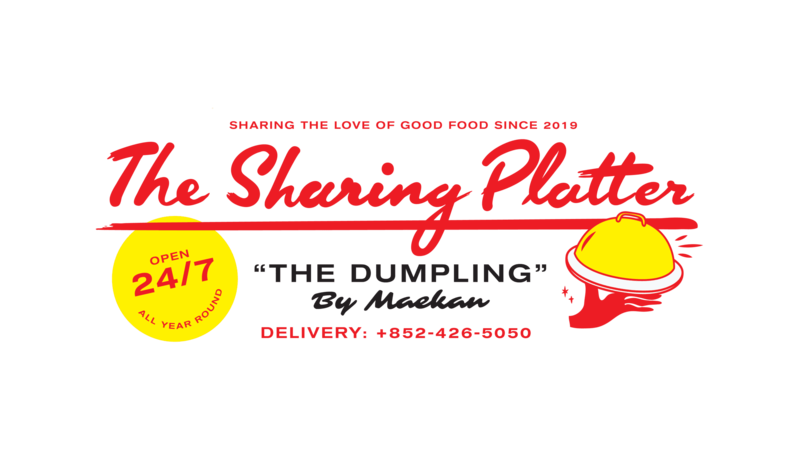 The dumpling uses square wrappers made of flour, egg, water, and salt, and is most commonly filled with ground pork and shrimp. While sometimes deep-fried, Chinese wontons are usually boiled and served in broth. In Cantonese cuisine, wonton noodle soup is extremely popular while chaoshou, a Szechuan variety, uses just pork for a filling and sweet soy and chili oil sauce. A version of this dumpling is now, of course, a staple in American Chinese cuisine. It is served in soup or served deep-fried dumplings with duck or plum sauce. Deep-fried strips made from wonton wrappers are also a common appetizer. For take-out orders, bring your own container and enjoy 5% off! We’ve come to the last category of stuffed dumplings where the people preparing them have decided to forego the folding and pinching and gone to just rolling them into balls or scooping them. Plantain dumplings represent one of special instances where the dough can be made with a fruit-based starch, and are popular in regions that make use of the banana relative such as Ecuador and other South American countries. Bolón de verde get their name from ‘bolón,’ which is slang for large ball and ‘verde,’ which alludes to the extra starchy green plantains used, which have to be cooked to become edible. The plantains are fried until tender, mashed into dough, and then stuffed with cheese, chorizo or chicharrones—which in Ecuador, are chunks of deep fried fatty pork meat, and not pork rinds as in Mexico and throughout Central America. These stuffed dumplings can then be refried for a crispy texture and then served for breakfast or brunch, or as a side dish or appetizer. Often called the national dish of Lithuania, Cepilinai (lit. ‘zeppelins’) are made from potatoes that are grated or riced (forced through a sieve or ricer). They’re then stuffed with ground meat, dry curd cheese or mushrooms. Typically served as an entree with served with sour cream, bacon bits or pork rinds, they can range from 10-20cm long depending on the region where they’re made. Derived from the word knödel, knedle in this case refers to plum dumplings popular throughout Central and Eastern European that use a dough often made with mashed potatoes. The name differs depending on language, but most names for this dish throughout the region have some form of knödel, knedle, or gomboce in them and are popular among Austrians, Poles, Hungarians, Romanians and in other regions where plums are in abundance. You can’t get more simple and delicious than stuffing a whole plum into a dumpling, boiling it and then finishing it off with sugar, cinnamon and buttered bread crumbs. These are then served as dessert, as a meatless main course or as a starch to accompany a meat dish. Other regional variants replace the plum with apricots or other fruits. Palt is a Swedish meat-filled potato dumpling common in northern parts. Traditionally served with butter and lingonberry preserves, palt is distinct for its uses of raw potatoes while kroppkakor, another Swedish potato dumpling, uses pre-boiled potatoes. Like Swedish kroppkakor, the Norwegian raspeball is potato based, but distinguishes itself with its blend of half cooked and half raw grated potatoes, which are often stuffed with bits of salted lamb or pork. Accompaniments vary widely throughout Norway with some locales preferring cured meats, fat, rutabaga, syrup, sour cream or milk. A common everyday and holiday dessert served in regions with significant ethnic Chinese populations such as Malaysia, Tong Yuen (“soup balls”) are glutinous rice balls filled with a paste of mashed sesame, black sesame, red bean, peanut or yam. These are served in a sweet gingery dessert soup, making them perfect for a light finish after a family dinner. What would be accurately translated as “crystal dumplings” start out as opaque golf ball-sized pearls (white from the flour to prevent sticking) before taking on their namesake as they’re boiled. These translucent dumplings commonly attributed to the Chaozhou school of Chinese cooking and take on vivid shades of purple, red, green or yellow depending on if they’re filled with yam, red bean, mung bean or custard. Got questions or comments? We’d love to hear from you! Drop us a line at info@maekan.com or by DM through our Instagram.